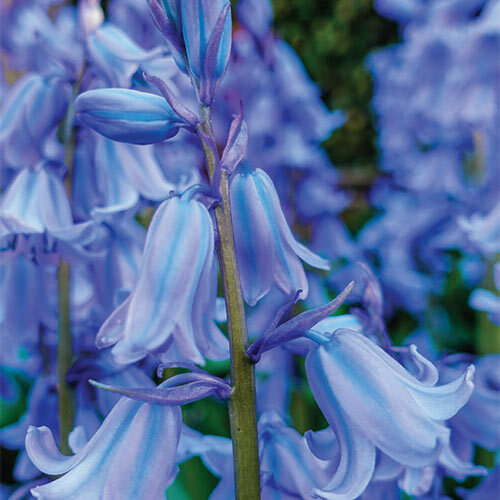 We're pleased to offer this impressive Spanish Bells/wood hyacinth variety that is sure to please no matter where your customers choose to plant it. Excelsior is an all-around perennial that adds a terrific touch of color and beauty to so many places in the landscape, it will actually be hard to choose just one or two sites. But, why choose? Its pretty blue, bicolor blooms sit atop stems that grow to 22" tall, making Excelsior ideal for late-spring borders, decorative pots, rustic rock gardens and charming woodland areas. It naturalizes well, reappearing yearly with increased vigor and beauty, and is very easy to grow. Makes a fantastic ground cover as well. 5-6" cluster containing up to 12-15 hanging, bell-shaped flowers.